Procreate painting in Mexican church, plein air painting in churches, Mexico. Layers of transparency, pattern and texture, watercolor digital ipad plein air painting, Mexico. One of the biggest reasons I wanted to master digital painting was to take it into places just like this where real paints would NOT be welcomed. 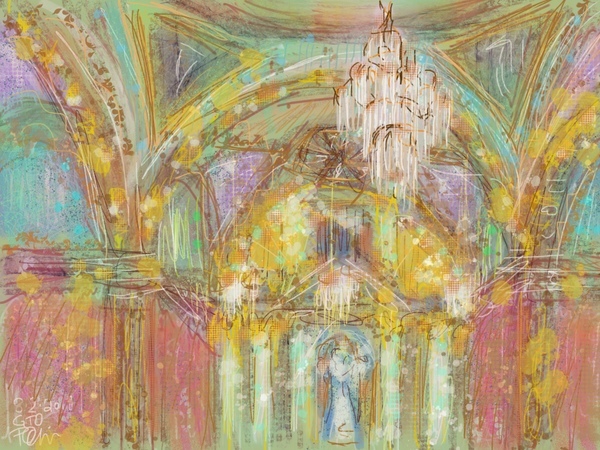 Working in layers allows for the chandelier to sit above the watercolor background of the church walls. Digital iPad painting on iPad with simple stylus.